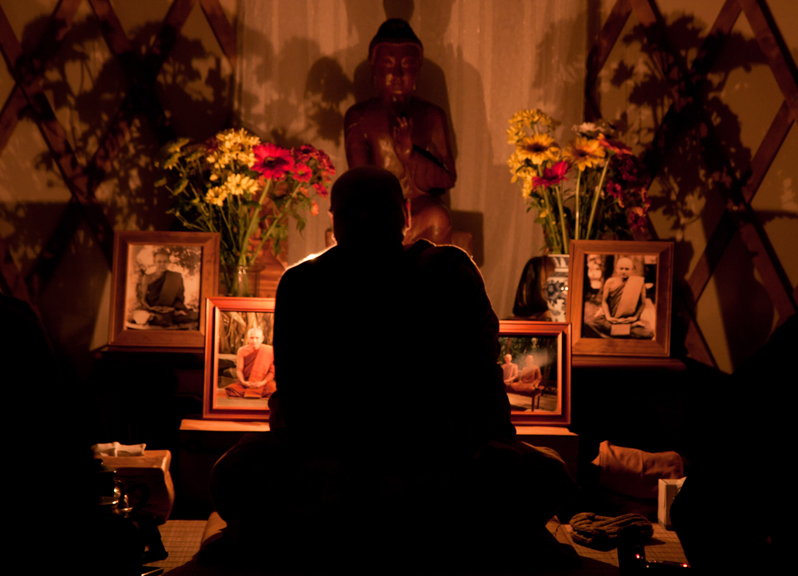 Listening to the Ajahn giving a Dhamma talk, listeners seated on the floor, the chanting; this is an event that goes all the way back to the time of the Buddha and it fills me with awe to consider that moment then is actually this moment now. These days, I don’t have the chance to be present in the Dhamma hall very often and I listen to the Dhamma on audio files, CDs [link to: Forest Sangha download/ listen]. There are some talks on youtube and I was watching one recently about ‘non-self and reincarnation’. Something clicked for me there. It was an instant of insight but the video got stuck in buffering, unfortunately, and I had to wait. The long pause somehow intensified this quickening, but when the video resumed I found the immediacy had passed. I downloaded it later and studied it again but it was like holding on too tightly to something that’s gone. If I’d had a transcript of the Dhamma talk to read while watching the video, I wouldn’t have lost the place. And anyway, listening to a talk is sometimes too fleeting for me, I usually try to make notes that I can refer to later. I’m interested in how to make an accurate simultaneous transcript of a Dhamma talk from an audio file using voice recognition software – can it be so finely tuned? I remember seeing musicians sitting in the audience at an orchestral performance listening to the music and reading the score (the musical notation sheet) at the same time. Listening, backed up with reading, is essential in any learning situation. There’s also writing and discussion. All of these are required in order to study the subject. Listening on its own is not enough. I came across something in a webpage about how we listen to a speech given by a public speaker and in the first 20 minutes people can only remember about half of what was said. After that, recall drops off further. It may be that listening to a Dhamma talk is different from listening to ordinary talks because the words of the Dhamma are likely to have an impact greater than the normal functioning of the short-term memory. It goes directly into long-term memory – deeper in a state of knowing? I’m not sure about this but the problem is it’s not immediately ‘remembered’ unless you make notes and discuss with others about what they can recall. For this reason, reading the Dhamma talk is possibly better than listening to it although doing both is best. When I read it, the pace of involvement is controlled; I can read, make notes, then go off and do something else and come back later. I have the option of re-reading and even if it ends up that I don’t, just the possibility that I can do that has an effect upon my ongoing understanding of the text. It appeals more to a contemplative understanding that takes place over a longer period. This is partly because I’m used to the idea that a written text is a considered piece, it has been constructed in a different time; it may be written and rewritten in early drafts before reaching its finished state. Our reading attitude to a written text is conditioned by this kind of experience. It’s what we’re used to. The transcript of a Dhamma talk is quite different. It has the appearance of a planned, structured piece of writing but it started off as a long utterance; a flow of words, without preparation, recorded and edited from an audio file. And it’s this quality that’s really quite special and uncommon in the world of publications today: the spontaneity of understanding, as it happens, written in words on the page. The reader experiences that heightened sense of meaning while reading parts of it, and it’s not due to a contrived technique in the use of words by the author or an editorial team of experts, it comes from the Ajahn, in the here-and-now. It is the Dhamma moment.